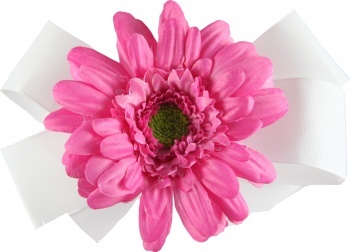 A Magenta Gerbera Daisy tops this white bow off. The daisy is on the larger size at 2.25" circumference and is attached to it's own alligator clip. The white bow is a 1.5" grosgrain ribbon wrapped in a boutique style with a flat center. It is attached to a French clip. Wear them together as shown for a great stylish look, or slide the daisy clip off and now each piece can be worn alone because each has it's own clip.